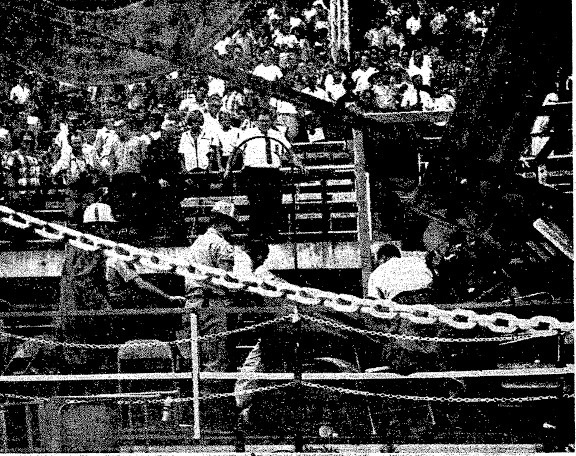 Three people died and 38 more were injured on Aug. 20, 1966, as Illinois State Fair workers were preparing a catwalk for a planned demonstration by U.S. Army Green Berets. The accident was the worst ever in state fair history. The Green Berets intended to demonstrate how they were trained to rappel down from helicopters to rescue wounded soldiers in Vietnam. The plan involved stretching a taut rope 100 feet from the catwalk atop the fairgrounds grandstand to the ground. All those involved believed the catwalk had been welded to the roof deck, according to testimony at a Sangamon County coroner’s inquest held Aug. 25. In fact, the structure was supported only by four angle irons attached to the deck with wood screws. “He said the sergeant grabbed the line to test it, and ‘that’s when all hell broke loose,’” according to an Illinois State Journal article about the inquest. The catwalk fell at an angle. Killed were two photographers who had been standing on the catwalk, Glen Lockwood of San Bernardino, Calif., and Dale Mueller of Overland, Mo., and Ralph Heger of Springfield, stage manager and electrician for grandstand shows. Heger, at ground level, was crushed when the catwalk fell on him. Another man, Ronald Drewett of Springfield, was critically injured, and four others required hospital treatment. The others injured were treated at a fairgrounds first aid station. The coroner’s jury ruled the deaths accidental. The tragedy was compounded the next day, when motorcycle racer Bill Corbin was killed in a five-bike pileup. *Sept. 25, 1900: A Chicago, Peoria & St. Louis Railroad train carrying fairgoers to and from the fair derailed near the southeast entrance (now Gate 2) of the fairgrounds and struck an oncoming Chicago & Alton engine. The CP & St.L train overturned, crushing both the engineer and fireman – John Ryan and Jeremiah Hall, respectively. Both men lived in Springfield. *Oct. 1, 1910: Larue Vredenburgh, president of the Springfield Automobile Club, was killed while driving in a 20-mile race. 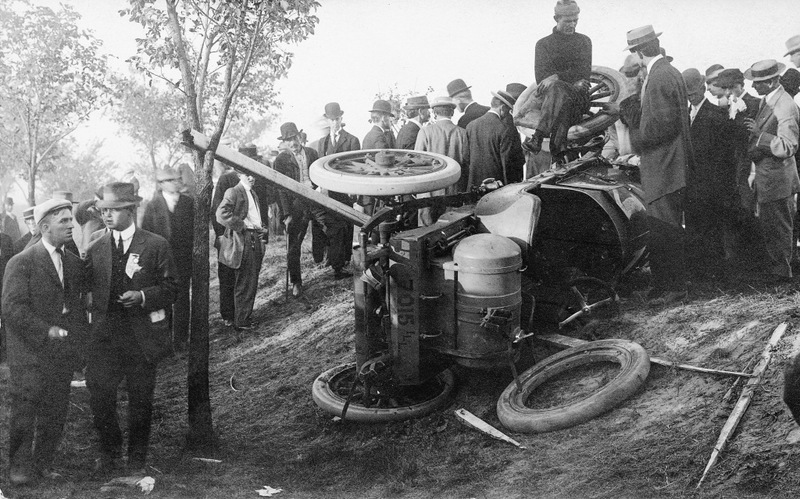 *Sept. 19, 1925: In the feature auto race, a multi-car accident killed driver Roy Humphrey. Three other drivers were injured. 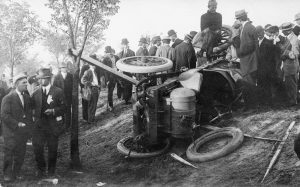 *Aug. 17, 1929: Auto race spectator William Wayne was killed and three drivers and seven spectators injured when two cars smashed through the outside metal rail. *Aug. 20, 1938: Billy Winn, winner of state fair auto races in 1934 and 1935, was killed in a crash on Lap 4. *Aug. 21, 1938: Motorcycle racer Floyd Faulkner of Tilton was killed in an accident during time trials. *Aug. 17, 1940: Carnival dancer Lorene Dudley was stabbed to death by her boyfriend, Booker T. Starks, a saxophone player with the fair’s carnival contractor, the Hennies Brothers Shows. Aug. 17, 1947: Rider Kenneth J. Ingle was killed in a four-motorcycle wreck. Aug. 22, 1964: Bill Horstmeyer, driving in his first USAC event, hit the fence on Turn 4. His car rolled over several times, landed upside-down on the front stretch and caught fire. Horstmeyer died a short time later. Aug. 15, 1996: Hope School student Tamara Terrell, 14, apparently panicked at the top of the carnival’s Kamikaze ride, slipped out of her shoulder harness and fell through an opening in the gondola she was riding in. She was struck and killed by the gondola as it completed its arc. Aug. 19, 2001: Dean Roper, who started 10th in the Allen Crowe Memorial auto race, had a fatal heart attack at the wheel, resulting in an accident on Lap 18. Hat tip: Information on all the above incidents originated with a comprehensive Illinois State Fair timeline compiled by Springfield researcher Tom Fitch. This entry was posted in Amusements, Disasters. Bookmark the permalink. My dad was there as a photographer for the old Illinois Information Service when that happened. I was eight years old and remember the panic in our house until we found out he was OK. Terrible accident and was so glad when dad got home that night. We spent a lot of time at the Fair in the sixties. Springfield was hopping during Fair time even in the Jerome area. I remember banners over Wabash saying “Welcome Race Fans”. Larry: Thanks for the memory of the accident. And you’re right about the fair being a big deal. I was a north-end kid, and the fair was always the culmination of summer vacation. I was there. I had gone down to the concession stand to get a hotdog with Tim Delrose and Tony Sebino.Those two went to the john and as I was waiting for their return I tried to go out by the stage that was set up.The man (who I now know was Mr.Heger) was real nice but firm and would not let out there so I turned around and started to walk away. I immediately heard a very loud noise and turned around to see what had caused the noise.All that was there was a pile of 2x6s or 2x8s and some pipe. Another gentleman came running over and lifted some of the boards and here was Mr. Heger with a very severe head wound.It was very obvious that Mr. Heger was no longer with the living. If he hadn’t been doing his job I probably wouldn’t be here to tell about it! Thanks, Chuck. We appreciate the firsthand memory. I was 15 at the time and got there an hour after the incident. Ralph Heger was my Grandfather. My dad, Ralph’s son, was working sound at the Coliseum and rushed to the hospital when he got the word. He and I went back to the grandstand in time to see the crew trying to clean up the blood as there was a show that night. In the aftermath when people were looking for someone to blame my grandfather was said to be responsible but he was the stage manager, not the building manager. Only the fair manager could sign off on the event. Ralph Heger advised them against it. He was only on that side of the stage to ensure nobody got hurt. Thank you Chuck for sharing your brief encounter with Grandpa. Mr. Edgecomb: Thanks for the note, and our condolences for your loss. Roland Heger was my grandfather and Ralph’s brother. We have been looking up some family history lately and came across this article. We would love to get in touch with your family. My dad remembers when this happened. We are so sorry for your loss.